The border area of Eastern Finnmark has, with the exception of the Cold War (1945-1989) been a place where Norwegians, Russians, and the indigenous Sami population have traded and interacted. In Day 7's menu, Coastal Kitchen featured the Russian influences with ingredients that are common to both countries. Reindeer know no borders and traditionally both reindeer and indigenous Sami have crossed the borders between what is today known as Russia, Norway, and Finland. The reindeer meat served on the menu was from the traditional Sami territories in Finnmark. 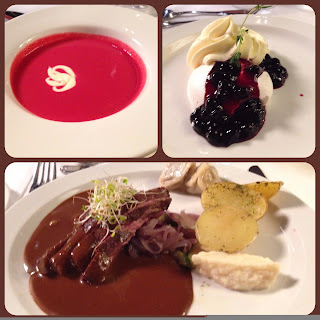 It was complemented with Borscht, pelemini (a form of Russian filled pasta), and celery puree. Dessert was Pavlova with berries. For some passengers, Kirkines was the conclusion of their voyage. There was time for everyone to enjoy the usual breakfast buffet prior to arrival. Directly upon arrival there were buses at the dock for those passengers heading to the airport or city center. Tour buses were also there for passengers, like us, that were booked on organized excursions. 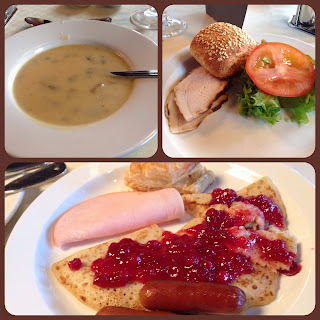 We spent the morning at the Russian Border and returned to the ship just in time for lunch. 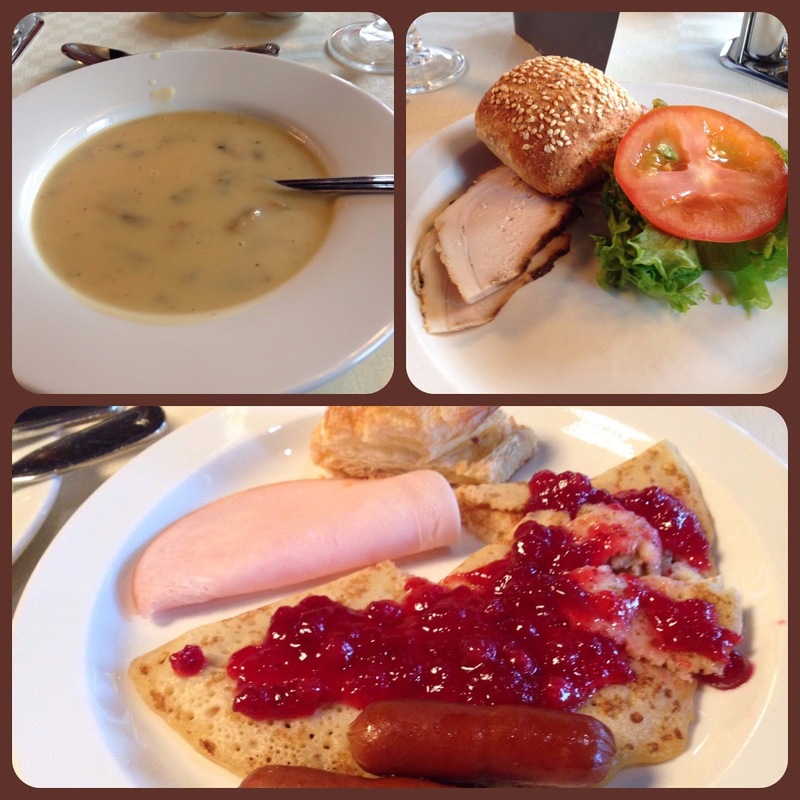 As usual there were several cold and hot choices on the buffet. After enjoying a cup of soup and a sandwich there was time to relax in the panorama lounge while enjoying the scenery. 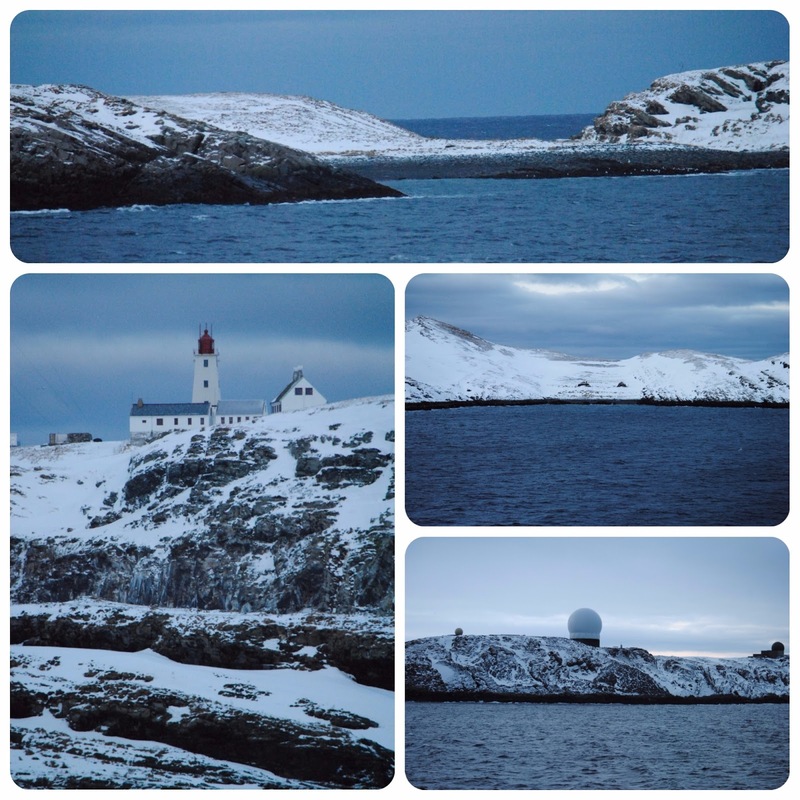 The Vardø Lighthouse, built in 1896, is erected on the island's peak. The island is now uninhabited and in the steep mountainsides around 40,000 pairs of birds have their nesting place. Hornøya is, because of this, a preserved wildlife reserve. 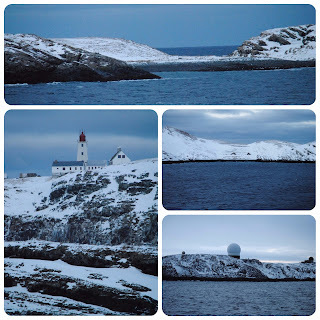 When you turn south, you will see the southern side of the Varanger Fjord behind the Globus-II radar. 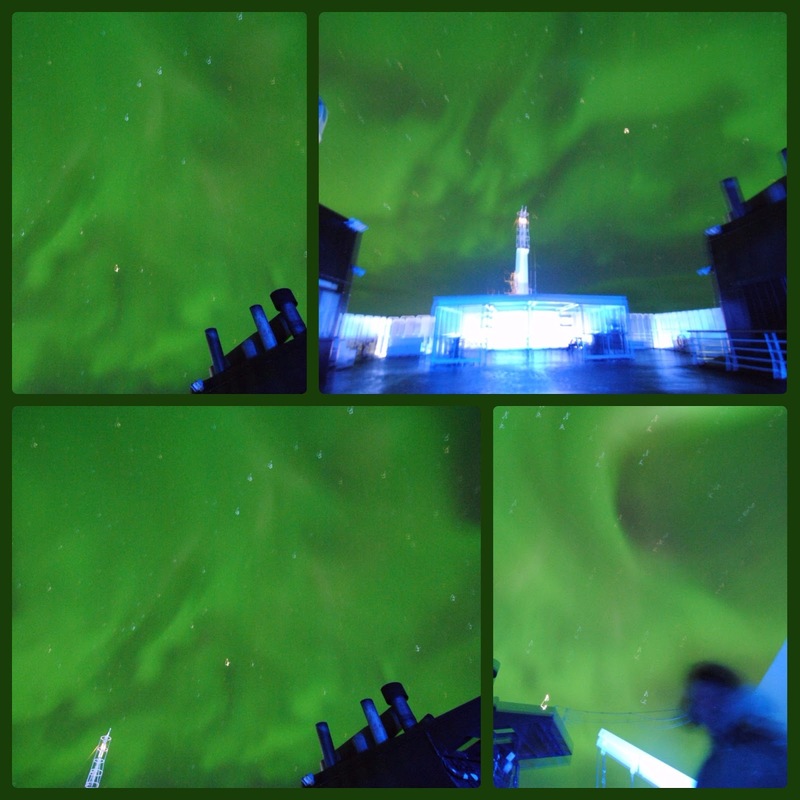 In Vardø you can enjoy wind from all directions, waves splashing, snow in large amounts and - in clear weather - truly fantastic northern lights. We stopped here for about an hour before dinner. It was just enough time to visit the nearby fortress. Vardøhus fortress was built in 1734–38 by 40 soldiers from Bergen. The star-shaped fort was built in eighteenth-century fortification style, with low embankments designed to withstand cannon fire. Inside the fortress installation, there is a collection of historical wooden buildings from the 1700s and early 1800s. The fortress was built to guard the border with Russia, although it is not known whether Russian forces ever attacked the installation. However, the fortress guns did open fire on English troops during the mainland blockade in 1808 and targeted German aircraft in June 1940. The vistas became more dramatic as we approached Kirkenes, the end of the northbound cruise. 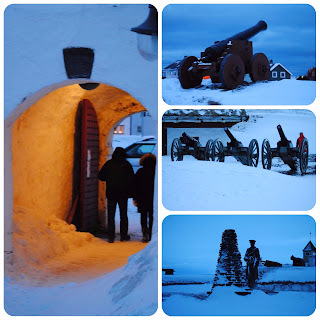 We arrived early in nearby Vadsø and just after breakfast, we arrived in Kirkenes. At 30° East, Kirkenes is further east than St. Petersburg and Istanbul. 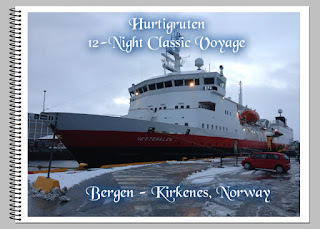 The only town in Norway where East meets West, Kirkenes was the turning point of our Hurtigruten voyage. You can see the Russian influence characterized by street signs in both languages, and you can often hear Russian being spoken. 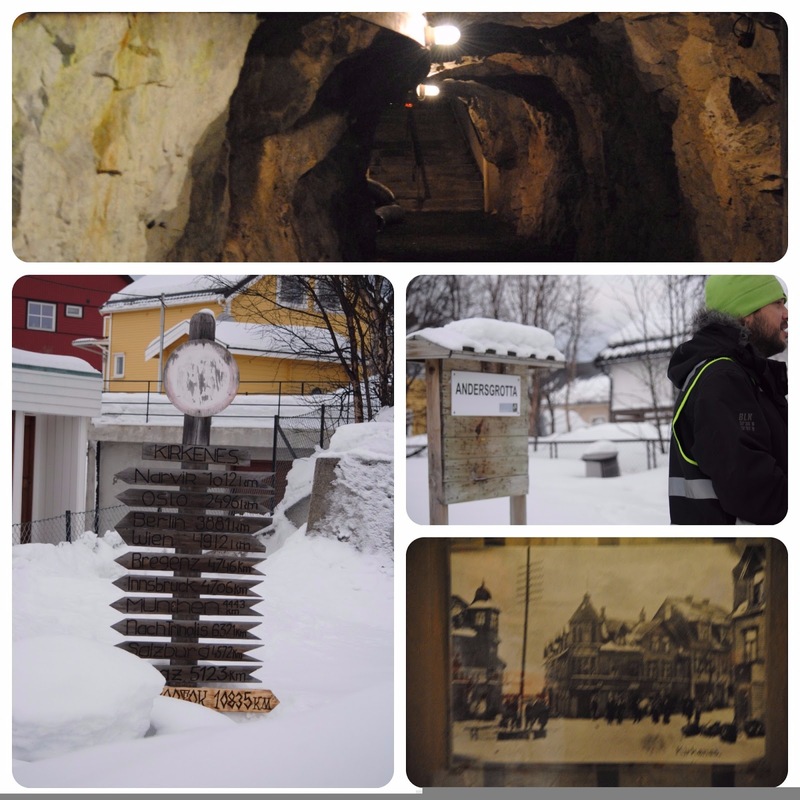 Our first stop was Andersgrotta, the town’s bomb shelter during World War II. Here, we were shown a film about town's civilians and their experiences during the war and walked through the shelter. Siberian taiga. We passed through the Pasvikdalen Valley, which is known to have Norway’s largest population of brown bears. The border crossing at Storskog defines the limits of the Schengen area and is one of the most guarded borders in Europe. Unfortunately, we were not allowed to cross the border, but were allowed to take photos. Back in Kirkenes we made a stop at the Prestfjellet Mountain, which overlooks both the town and our waiting Hurtigruten ship. 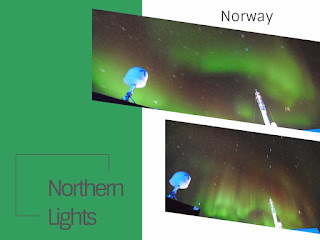 As we continued our journey, day 6, north along coastal Norway on Hurtigruten MS Vesterålen, the sky was crystal clear and the temperatures were cold - perfect conditions for Northern Lights to appear in our path. We learned the night before that you need to be ready, because the Northern Lights will appear all of a sudden and if you don't want to miss a minute of the action, time is of the essence. After dinner we'd retired to the lounge for some coffee, tea, and conversation. Our camera was mounted on the tripod and warm clothes were laid out on the bed. Once the crew would make an announcement, we could run back to our cabin, get dressed and go. It turns out we didn't have to wait long - the Northern Lights appeared over our ship around 7:15 PM and for the next two hours they danced their way across the northern skies. We setup our tripod pointing one direction and all of a sudden someone would gasp and there would be another display somewhere else in the sky. It had been a long exciting day and now that the Northern Lights show was coming to a close, we headed back to the cabin to settle in for the night. We did keep our camera gear and clothes ready, just in case. Inside the cabin there is a switch that you can control whether or not you want to get Northern Lights announcements. The speaker is on the wall plate, above the table which is between the two fold down beds. We opted to turn it on to allow announcements. 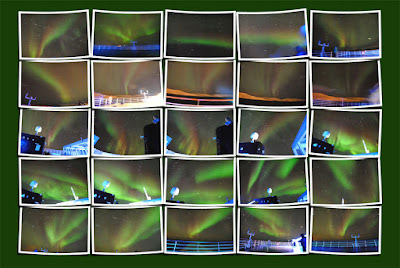 About 1 AM on day 7, the music played and the announcement followed that northern lights had been sighted. I didn't budge but my husband, first debated about going, and then decided that this was a once in a lifetime opportunity which couldn't be missed. He was rewarded by another dazzling dance show in the night sky. This time the show lasted for about 30 minutes. The Northern Lights are actually the result of collisions between gaseous particles in the Earth's atmosphere with charged particles released from the sun's atmosphere. Variations in color are due to the type of gas particles that are colliding. The most common aurora color, a pale yellowish-green, is produced by oxygen molecules located about 60 miles above the earth. Rare, all-red auroras are produced by high-altitude oxygen, at heights of up to 200 miles. 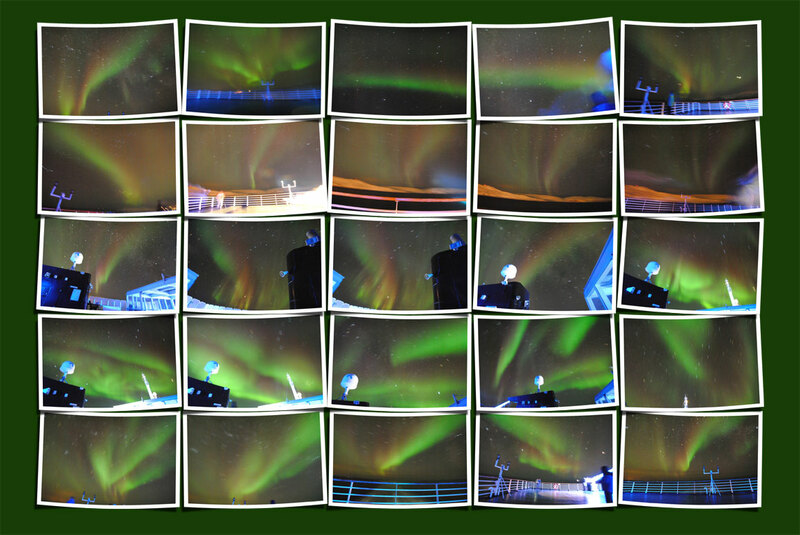 Nitrogen produces blue or purplish-red aurora.